Cambodian Inter-religious Council (CIC) is a national inter-religious body whole members are the highest religious leaders, formed in October 10, 2002, a year after 9/11 attack in the United State. In the mid of 2002, Mr. William Vendley, general secretary of World Council of Religion and Peace (WCRP), made a trip to Cambodia to discuss with Royal Government of Cambodia to form an Inter-religious council which represents all faiths in this country. At the beginning, CIC mission were to facilitate the potential of religious followers, to contribute to peace in Cambodia as well as in the world, to develop country by following the principle of nonviolence and understanding due to each religious scripture. On the date of launching, CIC received the recognition from the King, government, embassy, NGOs, and peace activists. The join statement recognized an important religious rules on reconciliation and reconstruction of the country, the commitment to culture of peace, Environment protection, participation in social development, and peaceful religious co-existence without trying to convert other religionists by force or cohesion. Over last 10 year, CIC have played important rule religious harmonization in Cambodia and open space for local interfaith initiatives. Below is a summary of first quarterly report in 2016. We would like to include the activities of December 2015 as these activities were highlight and impact of previous cooperation. In order to develop resource materials for interfaith work in Cambodia, CIC have collected books, article, research paper, film, graphic, and art works for the interfaith research library, both digital and printing. The 30 digital stuffs are interred into data base and 15 books on interfaith are collected. Some book is translating into local language for distributing to the school libraries around country. This interfaith library served as resource for writing article, a guideline for interfaith work, and assist to student who are writing their research paper on this field. 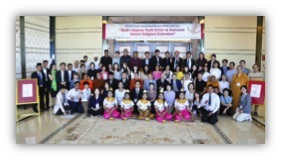 An article on “Buddhism and Interfaith dialogue” written by CIC youth was published in Reaksmey Buddhism. About 6000 copies of this magazine were distributed during Annual Buddhist Summit. This article included history and basis of interfaith dialogue, and how Buddhist should behave in the multi-religious society. The idea was drawn from: Ghandi’s Hope: Learning from other religion as a path to peace by Jay McDamiel, World Religion Universal Peace Global Ethic/Golden Rules by Malaysian Interfaith Network, Interfaith Dialogue by Interfaith Cooperation Forum, and Gem of Buddhist Wisdom by Ven. K. Sri Dhammananda. With the Cooperation between CIC and Mekong Dialogue Institute, The Stories for Peace was translated into local language and ready for printing. These interfaith resource is published by Sarvodaya and retold by Matt Weiner. Before translation, CIC youth had got permission from Sarvodaya Center in Sri Lanka. Recently, CIC youth is supervising university student, Mr. Yan Hean writing his MA research thesis on “Religious Harmonization in Cambodia”. This thesis will be presented in late June 2016. Develop action plan to be advanced by the Asia and the Pacific Interfaith Youth Network (APIYN), including the development of national and local level interfaith youth networks in respective countries. The opening ceremony was hold at the Dara Airport Hotel on the morning of December 7 with the present of local medias, friends and NGOs who are working in interfaith peace building, youth delegates and religious leaders presided by Samdech Tep Vong, the Supreme Patriarch of Cambodia as a senior religious leaders and a represent of CIC as the hosting country. During these three days, youth delegates had taken part in workshops and group discussion, to learn about Cambodian history and culture, to visit historical sites, to share the country reports and up-coming plan, and to do the volunteering activities such as teaching and painting the orphic schools. For the teachings, group of youth delegates from each countries used the traditional teaching instruments to teach peace to the children. On the 3th day of the program, APIYN was able to adopt the declaration including action plan, discussion about next APIYN Camp, and other business. The future actions at the National and Regional level in Asia would be such as the partnership, social media campaign, interfaith education, youth conference, interfaith on environment, and strengthening Religions for Peace National Interfaith Youth Networks and so on. The closing ceremony followed by farewell party and launching of Cambodian Interfaith Youth Network, which will closely work with CIC. On December 14, 2015, the highest religious leaders who are all board members of CIC were invited to join the Day of Pray and Action 2015 in Cambodia. In partnership with UNICEF, faith-based institutes and the religious communities, Ministry of Cult and Religion organize this annual celebration to disseminate the religious moral vision for harmonization in Cambodia and to celebrate the day of pray and action for children. 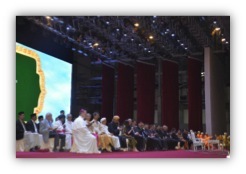 Over 4,400 people who are religious leaders and followers from the Buddhist, Christian, Muslim, and other faiths, government officials, NGO staff, children, and youth participated in this occasion which is celebrating by religious practitioners around the world. The opening was hold at Koh Pich Theater with the honoring opening remark by Samdech Hun Sen, the Prime Minister of Cambodia. In his remarks, the Prime Minister expressed his support for this interfaith celebration annually, especially focusing on children and religious morality. The Prime Minister also urged the ministry of Cult and Religion to continue and to increase the cooperation with NOGs and faith-based organizations as partners for the sake of religious harmonization and development of Cambodia. The senior religious leaders representing each faith and the children released their key messages on protecting the child right. Various interfaith programs was also on the screen to show to public audiences before the program starts. There were 150 participants who are the highest officers from Ministry of Cult and Religion, NGOs, religious leaders and followers including Buddhist, Christians, Muslims, and other faiths presented in Cambodia. The program was presided by the minster of Cult and Religion. This celebration refer to the resolution 65/5 adopted by United Nation on 23 November 2010, the General Assembly proclaimed the first week of February every year the World Interfaith Harmony Week between all religions, faiths and beliefs. Since 2012, the religious groups, faith-based organizations, and individuals have celebrated this occasion together. In 2016, Cambodian interfaith groups had organized two programs: firstly, with highest religious leaders on February 4, and secondly, with the grass-root communities on the theme “Harmony among faith, harmony with nature” which included the awareness on environment and tree planting to respond to climate goal. Working Group of Interfaith for Peace (WGIP) was a main organizers and CIC youth today was a member of WGIP from the beginning in early 2005. All faiths continue to be involved in social development, humanitarian work and improving livelihood of community people without forcing or trying to convert them to believe in their own faith. This join statement opened door local interfaith initiatives of the faith-based and interfaith groups. Through this collaborative event, the organizing team held the preparative meetings and discussions that were hosted by the member organizations. One of results from discussion was that in the following years, this celebration will be held by rotate-hosting from religious place to place. On March 5, 2016, CIC youth were invited as resource person to share about “Peace Building and interfaith Dialogue” with 61 youth who were university and high school students and youth from 8 provinces/cities in Cambodia. Catholic Church of Cambodia has been annually organizing serial leadership trainings to their youth. After field trip to the killing field museums and poor communities, the topic on “poverty and peace building” was brought up as the discussion at this time. Through the previous cooperation on charity event, friendship meal and dialogue, and celebration of world interfaith harmony week, and so on, it’s created more space for dialogue while the interfaith team is able to invite and work together on this kind of program and other cooperative interfaith initiatives. CIC youth shared about Dialogue and discussion, Building vision for Just peace, Create peace about classroom such as setting up classroom as a zone for peace, practical classroom dialogue, and changing negative statement into more positive. He also briefly shared about how youth should prepare themselves in the ASEAN integration in terms of economic, political, social and cultural where dialogue seems be an in-needed approach. What should one do when violence happens among the classmate? How should the religious groups cooperate to deal with poverty? What does it mean by negative and positive peace? What is the relation between justice and peace? How should dialogue be managed more affectively? Some students shared the experiences of a being a minority faith in the class that was not much understood by others. The sharing followed by peace song “We Shall Live in Peace” both in English and Khmer as local language, the group photos, and exchanging book as reading materials. On March 13, 2016, CIC youth were invited to share about “Building vision for just peace community” which was organized by 120 university student as a learning peace camp. The sharing was focus on respecting diversity and just peace from the faith perspective. On March 27, 2016, CIC had organized the Quarterly board meeting in Phnom Penh with the presence the supreme patriarch, CIC general secretary, and representatives from Buddhist, Muslim, and Christian faith. This meeting aims at keeping all members updated the report from the previous year and plan for 2016. The team had discussed about the structure of CIC that will involve youth and women, the office and recruitment of a coordinator, fund raising for activities and office supplies, and review plan for another three quarters of 2016. At the conclusion of this meeting, the supreme patriarch Tep Vong provided an office space in Wat Onalum, Ven.Dr.Yon Seng Yeath was selected as General Secretary and Cordinator, and the team has suggested two ways for fund including contribution from each faith and proposal to some possible donors. CIC will be permanently officed in Unnalom monastery from now on. After the office has been set up, CIC will organize the consultation workshop/conference to address the key common issues for develop three year strategic plan and proposal for activities. To reflect on interfaith understanding and cooperation. For the first part, each NGOs, officers, and religious leaders and followers as the main organizers brought all stuffs including food items, reading books, shower soaps, towels, toothpastes, brushes, money and so on together and get them packed according to the number of prisoners. In 2015, over thousand prisoners had received this interfaith charity. After welcoming by the prison president, each religious leaders prayed, chanted, blessed, and enjoyed songs in each religious ways. Some prisoners followed the prayer and blessing according to their faiths. In their peace message to all participants, Buddhist monk shared about how people should transform themselves to be a good citizen. The Muslim imam shared about being peace while living here and returning home. 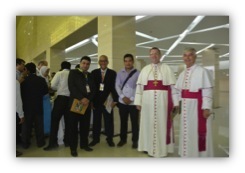 The Christian pastor and Catholic priest shared about love and unity in the name of humanity. Then, all prisoners received the charity packages from the interfaith groups with the warm greeting and hugs. For the second part, the whole group came for interfaith reflection at Catholic center. The reflection started with the presentation about Cambodian Inter-religious Councils (CIC) as a representing body of Religion for Peace Cambodia. Then, faith representatives and provincial department of ministry of cult and religion shared their reflection and commitment for future cooperation. The interfaith charity and reflection ended with solidary lunch and further discussion. The groups decided to continue this event in the coming years. Courtesy and regularly, the CIC and CIC youth visit and host the members, interfaith peace activists, and groups who are working on related field for networking. On March 16, 2016, CIC youth had meet with United Religion Initiative, a regional interfaith network in Cambodia, learn from each other, and discuss on possible interfaith activities. On March, 26-27, 2016, after the meeting, ven.Dr.Yon Seng Yeath CIC General Secretary, visited CIC Muslim leaders, Kaytom who’s getting sick. The following day, Catholic priest and his followers also visited and bring some gift to him.